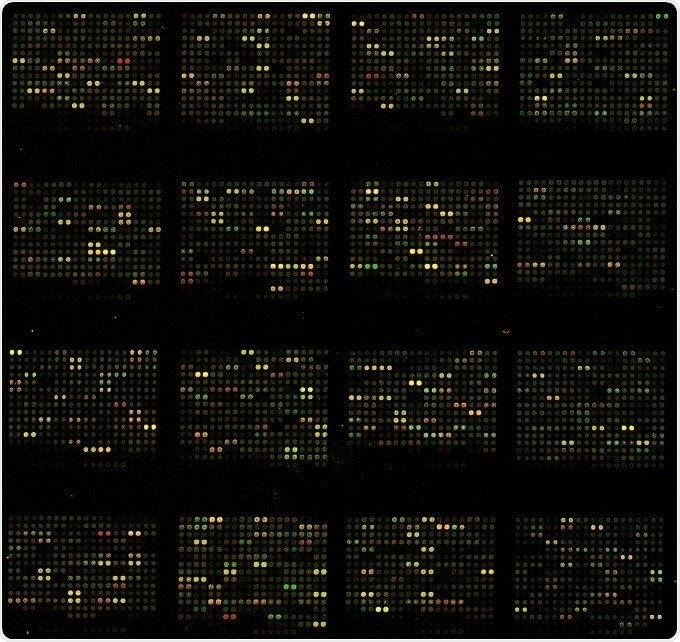 The microarray is a recently developed technology used in cancer research and in the pharmacological treatment of other diseases such as oral lesions. In this technology, a microscope slide (normally a 2D array made of glass, silicon chips, or nylon membrane) printed with thousands of minute spots in definite positions is used. DNA microarray (gene chip, DNA chip, or biochip) is one such technology that either measures DNA or uses DNA as a part of its detection system. In each of the spots in this array, a known DNA sequence or gene is orderly arranged. Altogether, the samples of all the genomes of an organism may be present in a single slide. A computer database is then used to record the location and sequence of each spot. These DNA sequences are compared with each other to get the needed information. This technique enables researchers to investigate and analyze the expression of thousands of genes in a single reaction and address issues that are believed to be nontraceable. The basic principle behind the DNA microarray is “nucleic acid hybridization”. In this process, two complementary strands of a DNA are joined together by hydrogen bonds to form a double-stranded molecule. This helps researchers to compare and analyze the DNA or RNA molecules of identical sequences. Several methods are used to prepare a spotted array. In some cases, already designed probes that are attached to fine needles are printed on a chemical matrix surface using a robot (surface engineering). Photoactivated chemistry and masking are also used to make probes, and these can also be bought from shops. Collection of samples - a sample can, in this case, be defined as the cell/tissue of the organism that we wish to conduct the study on. Two types of samples are collected: healthy cells and infected cells, for comparison and to obtain the results. Isolation of mRNA - RNA is extracted from the sample using a column or solvent like phenol-chloroform. From the extracted RNA, mRNA is separated leaving behind rRNA and tRNA. As mRNA has a poly-A tail, column beads with poly-T-tails are used to bind mRNA. After the extraction, the column is rinsed with buffer to isolate mRNA from the beads. Buffer disturbs the hybrid bonds between the mRNA and beads by disturbing the pH. Creation of labeled cDNA - to create cDNA (complementary DNA strand), reverse transcription of the mRNA is done. Both the samples are then incorporated with different fluorescent dyes for producing fluorescent cDNA strands. This helps in distinguishing the sample category of the cDNAs. Hybridization - the labeled cDNAs from both the samples are placed in the DNA microarray so that each cDNA gets hybridized to its complementary strand; they are also thoroughly washed to remove unbounded sequences. The collection of data is done by using a microarray scanner. This scanner consists of a laser, a computer, and a camera. The laser excites fluorescence of the cDNA, generating signals. When the laser scans the array, the camera records the images produced. Then the computer stores the data and provides the results immediately. The data thus produced are then analyzed. The difference in the intensity of the colors for each spot determines the character of the gene in that particular spot.